Pavo Pavo is an experimental pop band from Brooklyn, NY. The band started writing together while studying music at Yale, and since then its members have worked closely with indie and classical heavywights such as Here We Go Magic, John Zorn, Dave Longstreth, Porches, Olga Bell, Lucius, Roomful of Teeth, and San Fermin. 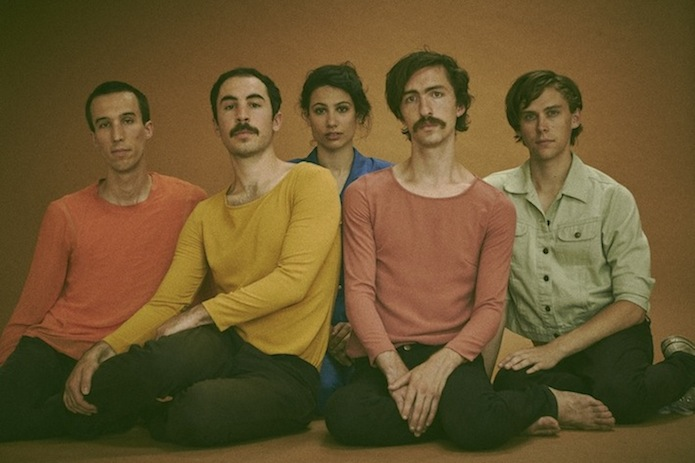 Hailed by Stereogum as “weightless pop music that sounds like it was beamed down from a glimmering utopian future”, Pavo Pavo is a mind meld of five songwriters with a shared vision for creating new, expressive worlds of sound while using meticulous ears to evoke the feeling of bygone eras. Pavo Pavo is Eliza Bagg on violin, synthesizers, and voice, Oliver Hill on guitars, synthesizers, and voice, Nolan Green on guitars and voice, Austin Vaughn on drums, and Ian Romer on bass. The group borrows its name from the southern constellation, Pavo, Latin for peacock – an elegant and spectacular link of cosmic dust. Co-produced by Danny Molad (Lucius) and Sam Cohen (Yellowbirds, Apollo Sunshine), Pavo Pavo’s music moves with symphonic elegance. Guitar stabs, washed out harmonies, and rumbling synthesizers come and go like the tides of the ocean. The music on Young Narrator in the Breakers describes the magic and panic of adult life; a breaker is that wave whose potential energy is being transformed into turbulent kinetic energy. Young Narrator in the Breakers will be released 11th November on Bella Union.